The goal in our project for the Oak Showroom has been to turn a space that was originally thought to showcase lots of different materials into a space with an atmosphere, a place that can tell its future clients that Oak is the right company to chose for their projects. 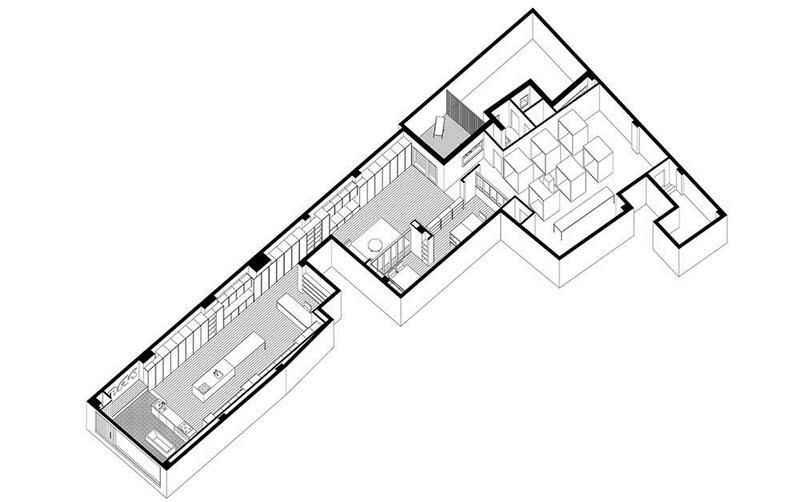 The showroom is divided into the areas that were required by the program: kitchens, bathrooms, floors, etc.. But the whole space is unified by an envelope of wooden slats and closets that bring a unity. The feeling once you are in the showroom is that of being into a home; with its kitchen, its bathroom, living room and the company office spaces, that are part of the showcase. The original space was separated in two parts due to the stairs and elevator placed in the middle of the housing block. But this division did not work with the idea of the program, so we enlarged the first area by extending the wooden frame beyond the “natural” divsion of the space. By doing this, the clients of the showroom are moved to the end, and they can see much more and feel like being at home, enjoying the whole place. At the end of the showroom, a more storage like area is placed, by painting the whole space in black and building several boxes that showcase different type of bathroom solutions as well as different materials that the construction company can offer. 地址: c/ Numànica, 48, Barcelona. Address: c/ Numànica, 48, Barcelona.